Cost — $21 CAD includes tax. Shipping is extra and available only for North American orders. If you wish to order more than one copy, please phone Grace’s office at 778-808-6440. Postal rates vary greatly, and she will ensure the best rate when you deal directly with her for group orders. Everything about us, including our destiny, flows from the way we think. If we hope to flourish in every part of who we are—mental, emotional, spiritual, and physical—we’d best align our thoughts with God’s truth. Based on Romans 12:2, Forever Changed takes readers deep into God’s Word daily for ten weeks. 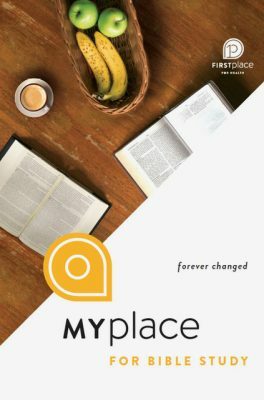 It identifies common inaccurate thoughts about topics including who God is, how God thinks about us, prayer, suffering, forgiveness, obedience, and more. Then it contrasts the lies with solid biblical truth. Each week includes additional leaders’ questions to delve even deeper if desired. Written in partnership with First Place for Health, the material naturally encourages readers to apply the insights they learn to their wellness journey. However, the principles taught apply to every man and woman wishing to thrive mentally, emotionally, spiritually, and physically. Learn to identify faulty thinking patterns that have influenced their behaviors. Discover the contrasting truths to those inaccurate thought patterns. Experience personal transformation—“necessary and permanent change in their very core” when they learn to live from the truths they will discover. The book includes weekly Scripture memory verses, pages to record prayer requests, pages to track one’s food intake, and healthy recipes. It also includes a free downloadable audio recording of meditative prayers spoken by Christin Ditchfield. It will soon be available on Amazon and for Kindle.